While there has always been a clean up challenge for every new home builder, it is my opinion that limited resources due to cost cutting has caused my new Ryland Homes house to be delivered with many clean up issues that should have been addressed before our move in date (Original estimated completion date = 12/15/07, Actual "Close of Escrow" delayed by Ryland = 1/18/08, Move In date = 2/3/08) . 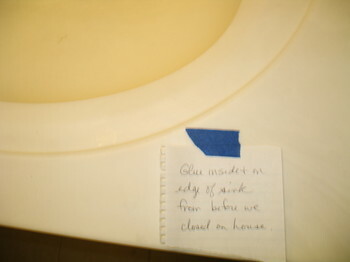 The photo above (click on to enlarge) shows a note placed by my wife that says: "Glue inside & on edge of sink from before we closed on house." While Ryland Homes has been great about cleaning things up, and we are happy with our lot location and Ryland in general, there have been so many things to clean and touch up that from 1/18/08 to today, 2/12/08, there are still many things like shower/tub framing, etc. that still have "blue tape" noting where the cleaning and touch up need to be done. Cleaning products like "Goof Off", Fantastic, Low Odor Mineral Oil, razor scrapers, "Solid Surface Cleaner and Polish" for vanity areas, etc. are all being used to get glue from tape, cement, "mud", paint, etc. off the inside and outside of our new home. Potential buyers of new homes look at model homes that don't have clean up or touch up paint issues, and for most prospects that sets their expectations of how their new home will be delivered. While I have had previous new homes that needed clean up and touch up paint, my wife and I started off living in a "sea of blue tape", and we are still finding more things to touch up and clean as we live in our new Ryland home. Some may think this should be expected, but it's the amount of things needing attention OVERALL that has disappointed us. See my next blog post for specifics. Admittedly, we are detail oriented, and this can cause us to try to find more things quicker to clean up and touch up. Also, some people don't care if little nicks and scratches, little pieces of glue/"mud", paint on door hardware and tile floors, etc. are ever cleaned up, but we do. But, what a marketing opportunity for some new home builder to make it a point to deliver homes the way they deliver their model homes. While it may cost more money up front and delay delivery a bit, the word of mouth advertising would be worth it, in my opinion. Before you finish reading this post, please keep in mind that my wife and I did not enjoy our first year of Ryland Home ownership. See "My Last Ryland Homes Blog Post & My Attempt To Help Ryland Homes!" to get a better overview of our Ryland Home complaint to the BBB, and links to the over 100 Ryland Home problems that were all eventually fixed after 13 months of having much of our time wasted. What you're going through is the same as other new home buyers.. the builders don't give a rats a$$. We were in our house a year before things were addressed and we are still waiting for the walls to be finished both sanding and painting. They came 2 months ago and haven't been back. Thankfully they did the majority of the work on our 7 page list.. a lot minor but in every room; but as I said, there is still stuff needing to be done. It could be worst, we could be in our neighbors shoes where they have lived here for 2-3 years and are still waiting for their 1 year. We have been calling, faxing & emailing since we moved in. I would watch what I say about the builder because it might come back and bite you when you try to sell if you need to. Once we move out is when I will write reviews on our builder. Momerator, I'm sorry to hear that some of your first year warranty issues have not been resolved yet. I agree that this kind of customer aggrivation, stress, and time wasting can be an industry wide situation, and not limited to any one builder. I appreciate your warning about watching what I say. But, we don't intend to sell our house, and our's had many more problems (all resolved right now) than our neighbors (100 + vs. about 25). The fear of having a "hard to sell home", I believe, prevents some (maybe many?) tract home buyers from bringing their builder to the "court of public opinion" on the Internet. But, things are changing along those lines, as Internet usage increases, and people realize that "Internet transparancy" of all legitimate buyer complaints is the best way to help future buyers, and even the long term thinking ethical sellers. Also, as long as you get all of your warranty issues resolved, why would any buyer hesitate to buy? In fact, as a former Real Estate broker, I know that many buyers were looking for a 2 to 5 year old house, because they knew all of the initial customer complaints, and "hidden problems", should be taken care of by then, as confirmed by a professional "home inspector". If you read "My Last Ryland Homes Blog Post & My Attempt To Help Ryland Homes!" at = http://bit.ly/LddNE , you will see how I now feel about the entire experience. In short, I have forgiven my builder, and I want to help them and the entire tract home building industry.